The research was published today in the journal Nature Communications. 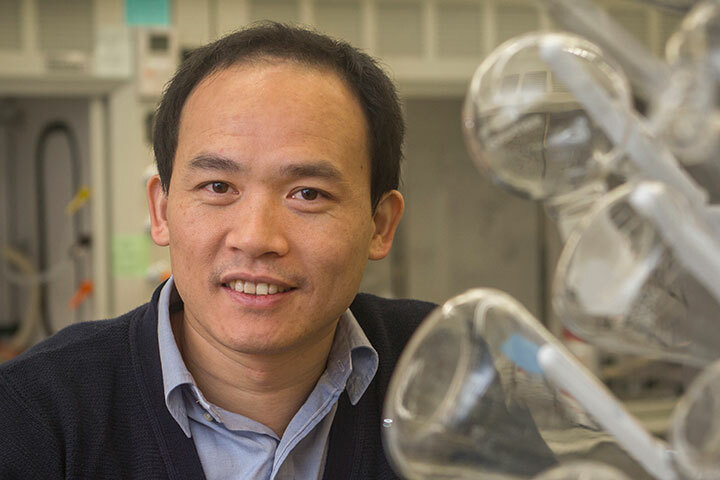 FAMU-FSU College of Engineering Associate Professor Biwu Ma has been working with a class of crystalline materials called organometal halide perovskites for the past few years as a way to build highly functioning optoelectronic devices. In this most recent work, his team assembled organic and inorganic components to make a one-dimensional structure. “The basic building block of this class of materials is the same, like a Lego piece, with which you can assemble different structures,” Ma said. These Lego-like pieces, scientifically called metal halide octahedra, can form 3D networks, 2D layers, or even 1D chains. While 3D and 2D structures have been extensively explored, 1D structures are rare. Ma’s team found a way to put these pieces together in a chain, which is surrounded by organic pieces to form a core-shell type wire. Millions of the organic-coated wires then stack together to form a crystalline bundle. From a distance these structures look like crystal needles. It is the first time scientists have observed these hybrid materials forming a crystal structure like this. This crystal displays very interesting optical properties, Ma said. For example, it is highly photo luminescent, which scientists can manipulate moving forward as they use it for different technologies. Hybrid metal halide perovskites have received increased attention in recent years for their potential applications in various types of photon-related technologies such as photovoltaic cells, LEDS and lasers. This new study takes that work one step further by showing that this 1D structure could be another efficient form to produce bright light. Ma came to FSU as part of the Energy and Materials Strategic Initiative with a mission of producing high-tech materials for next generation, energy sustainable technology. His work is supported through the Energy and Materials Initiative and collaborators at the FSU-based National High Magnetic Field Laboratory where some of the experiments were conducted. Ma’s co-authors on the paper are FSU professors Ronald Clark from the Department of Chemistry and Theo Siegrist from the FAMU-FSU College of Engineering; FSU research faculty Yan Xin and Lambertus van de Burgt; postdoctoral researcher Zhao Yuan; FSU graduate students Chenkun Zhou, Yu Tian, Yu Shu, Joshua Messier, Jamie Wang and Konstantinos Kountouriotis; and University of Florida Professor Kirk Schanze and UF graduate student Ethan Holt.